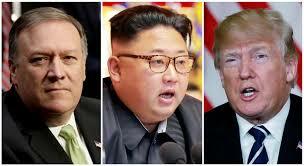 Sejuti Mourin: US Secretary of State Mike Pompeo is expected to return from North Korea with three American prisoners, along with details of the upcoming summit between North Korean leader Kim Jong Un and US President Donald Trump, a South Korean official said yesterday.Pompeo yesterday travelled from Japan to the North Korean capital, Pyongyang, and headed to its Koryo Hotel for meetings.The top US diplomat and accompanying officials were treated to a lunch by Kim Yong Chol, a former spy chief and currently the North’s director of the United Front Department, responsible for inter-Korean relations.Trump had earlier revealed the news of Pompeo’s second visit to North Korea but had not provided any details.An official at South Korea’s presidential Blue House said that Pompeo was expected to finalize the date of the summit as well as securing the release of the three American detainees.At yesterday’s lunch, Pompeo assured that the United States was committed in cooperating with North Korea for the sake of achieveing peace on the Korean peninsula.“I have high expectations the United States will play a very big role in establishing peace,” replied Yong Chol, the former spy chief. “For decades, we have been adversaries. Now we are hopeful that we can work together to resolve this conflict, take away threats to the world and make your country have all the opportunities your people so richly deserve,” Pompeo said.